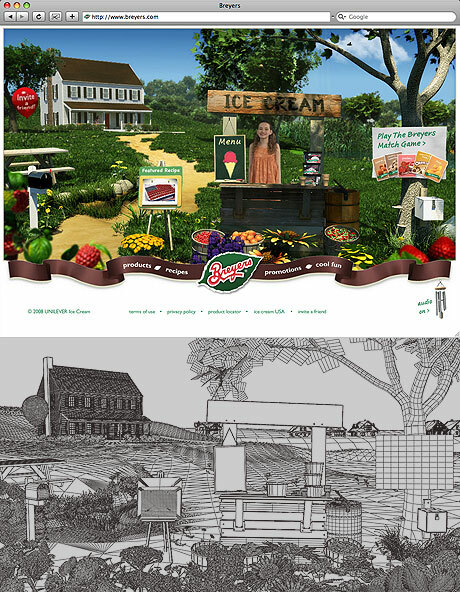 Meshfolk was commissioned by Ryan Partnership to build the breyers.com website for their client, Breyers® Ice Cream. We were responsible for realizing Ryan's concept in the form of an interactive 3D environment with stylized lush vegetation, fruit and architectural elements. 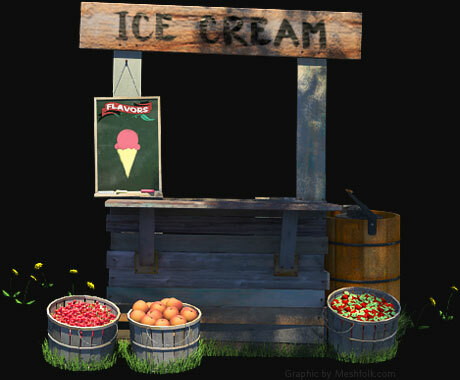 Highlights include a CG ice-cream stand with green screen actor integration, realistic trees, houses, and over 1.6 bilion blades of grass. Remember when you were a kid with that lemonade-stand entrepreneurial spirit? Well, this is the ice-cream stand version of that idyllic childhood dream. Every element in this project from the house to the trees to the baskets of fruit were custom made for this entirely CG/3D environment. 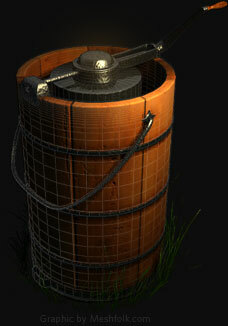 Here is a wire-frame screen shot of the environment from a 3D perspective.